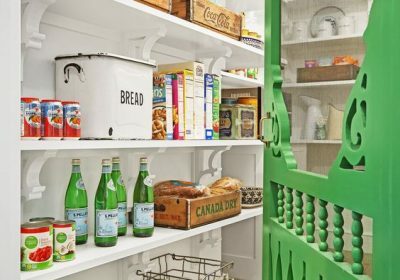 Run–don’t walk–to your nearest contractor, cabinet maker or handy family member and ask–nay, beg–to have one of these seriously smart solutions built into the storage around your home. Above: A drawer for all your endless utensils. This slide-out bathroom styling station. This pull-out sideways medicine cabinet. These slim drawers built in the bathtub casing. Designed by Wanda Ely, spotted in this tour on Houzz. This convenient spot for dry ingredients. From a 2009 issue of Maison & Demeure. As seen on Houzz, from Henarise Pty. Ltd. This cleaning supply cabinet with a built-in caddy. From Wood Mode Custom Cabinets. This hideaway pet dish and food storage combo. Another one from Wood Mode Custom Cabinets. Designed by Signature Design & Cabinetry and featured on The Kitchn. And this drawer, which is actually a ninja stepstool.